Second episode in Nike’s “What [...] Knows” series (once again, if you haven’t been following, the [...] part can be substituted by the player’s first name to make it look cool). 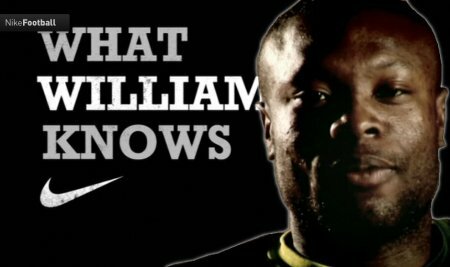 We had “What Wayne Knows” as the pilot episode, this time it’s Arsenal and France center-back William Gallas‘s turn. The Frenchman tells us about the joy of big-pressure games, the importance of winning the first ball, and why his first instinct as a defender is to counter-attack. “After playing for some of the top teams in France and England, the Arsenal man is a past master at shackling the best strikers in Europe” says Nike. Oh, and “he’s far from goal-shy himself” too. This entry was posted on Thursday, July 10th, 2008 at 8:37 am	and is filed under Ads & TV. You can follow any responses to this entry through the RSS 2.0 feed. Both comments and pings are currently closed.